As indigenous populations are invited to participate in cultural heritage identification, research, interpretation, management, and preservation, they are faced with a variety of challenges, questions that are difficult to answer, and demands that must be carefully navigated. 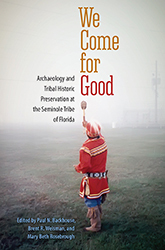 We Come for Good describes the development and operations of the Tribal Historic Preservation Office (THPO) of the Seminole Tribe of Florida as an example of how tribes can successfully manage and retain authority over the heritage of their respective cultures. With Native voices front and center, this book demonstrates ways THPOs can work within federal and tribal governments to build capacity and uphold tribal values - core principles of a strong tribal historic preservation program. The authors also offer readers one of the first attempts to document Native perspectives on the archaeology of native populations. "Offers a unique perspective on tribal appropaches to managing historic preservation and addresses the multiplicty of issues common to all tribal historic preservation groups." - Joe Watkins, Director, Tribal Relations and American Cultures Program, National Park Service. "A concise, detailed account regarding the enormity of the task THPOs face in successfully navigating the two worlds of federal historic preservation laws and statutes and tribal cultural beliefs, knowledge, and traditions." James Quinn, Tribal Historic Preservation Officer, Mohegan Tribe of Connecticut. "An important book that highlights the complicated, confusing, and often contradictory world navigated by the intrepid personnel of the Seminole Tribe of Florida's Tribal Historic Preservation Office." - Ryan Wheeler, Director, Robert S. Peabody Museum of Archaeology.